Dyno it this weekend to get a nice baseline! No point, it'll make a measley 180-190whp. We all do, in one way or another. lol. Looks like a fun car! I have to laugh a little about your power goals--you make it sound like 600 is modest. It's a 2jz. 600 is about 'normal' if not on the lower side. Yep, easy to make power, thats whats sweet about the platform. Thanks all! I do plan on getting a baseline dyno. Was going to do it this weekend at the dyno day but can't because I have to go up north. So I'll just have to setup a quick little dyno session one of these days for a baseline. Has anyone actually done back to back DB vs. MAP 2wd dyno tests to see how close they usually read? As for the "modest" power goal, haha. It's still a lot of power for little old me. But yeah in the grand scheme of things it's probably modest because I'm not going to be shooting for 1000hp like a lot seem to do with these motors. 600-700 is plenty of fun for me. 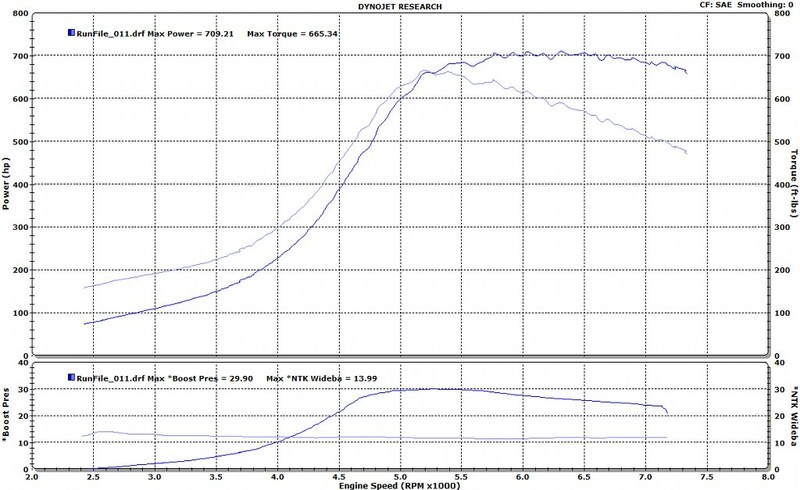 We have had Mustangs dyno here and then the next day at Hi-Tech for a dyno day and be within a few HP. But weather conditions, strapping, gear used, etc change from day to day and you can get different numbers even on the same dyno. Turbo cars are probably a bit less consistent because the load on the car determines how much boost it makes, so ours versus the street versus a Dynojet can all be a bit different in the boost a turbo car makes. We dynoed about 10 cars here 2WD that we had previously dynoed at the old Elite 2WD on their Dynojet and the numbers were all within a few HP. Thanks for that info. The basis of my question mainly was if I did a baseline at MAP, and had DB tune it later, is that baseline still halfway valid to see what my gains were. And sounds like the answer is yes because in 2wd they read "close", or at least quite a bit closer than awd. Last edited by Halon; 09-28-2010 at 01:21 PM.. The mod purchasing has begun!! Mod list added to first post Going to keep as much purchasing of parts, services, etc... as local as possible using our awesome vendors we have here!! So another thanks to those vendors, and individuals who've helped me out in one way or another so far!! I've been trying to decide which tuning method to go, and have recently been talking a lot with a guy over on the lexus forums about a megasquirt system that he builds and runs on his car, and on a few others in his neck of the woods. Anyone here have any first hand experience with any of the NEWER MS stuff? I know there's a lot of bad thoughts regarding the original MS, but I've heard some positive stuff regarding the newer versions. Couple of the cons are that it's less widely used, so there might be less support for it, less people willing to tune it, less people capable of tuning it to it's full capability due to less on-hands experience with it. Not Plug-n-Play so harness modifications may be required unless I can find any kind of pigtail to go inbetween the two. Batch injection, this is a grey subject for me. I heard that because of this, it may have to idle a little rich, but I am no expert at that at all. Is batch injection going to really kill drivability, or is it workable? When setting up AEM systems, do people always pretty much use sequential? Some pro's are it's about 1/3 of the cost of AEM. Don't need an external MAP sensor as it has one built in so you just run a vacuum line straight to the box. Would be wired in parallel with the ECU, not so that it acts as a piggyback, but rather acts in parallel with the ECU so that the ECU can still control A/C and stuff like that, while the MS box fully controls fuel, timing, 2-step, NLTS, knock, etc... The new TunerStudio software is supposedly pretty user friendly (from what I've read, no 1st hand experience here). So I'm currently a little torn. If anyone has some first hand experience, or some useful input into AEM vs. MS, feel free to voice your thoughts as I'm still a ways out from ordering anything, and am all ears at this point as I'm just trying to gather as many facts and opinions for now to help me make a better educated decision when the time does come. Last edited by Halon; 09-29-2010 at 12:11 AM..
My car made less boost/horsepower at MAP last june and I hadn't changed anything from the previous month when I was at DB. I'd say talk to the guy who will be tuning your car. I don't mind MS, but I've only seen the older stuff I think its a good product if you don't have any other choices, maybe a used AEM? Used AEM's are still $1100-1300 from the supra/lexus guys. The MS system from this guy is basically $750, and the TunerStudio software is free. Also no need to buy a MAP sensor as it has one in it from what he's said, so 1 less sensor to purchase. 2) batch injector firing (again not sure if this is actually a huge deal, which is why i'm asking). If I can find a way to be more comfortable with those 2 items, I may just go MS unless I am convinced otherwise. The fun of megasquirt is building it yourself, tuning it yourself and running it lean till it blows up. If you were ice racing this sc300, I would say totally do it. Now that you're ballin' with a toyota product, I'd get a motec ecu or something spendy like that. Megasquirt tech support is virtually non existant, so there's a huge learning curve. I built one once, and it connected to the computer and everything, but I never got it running on a car. I "tuned" a friend's MS setup to get the AFR's to a good enough spot. Cliff notes: Easy, but dumb. The flip side of this is, I will not be building it. It is a build that another SC300-er has built and installed on a bunch of SC's, and has apparently got it running pretty well. I'd be buying it from him, and as such he would be the tech support. So it wouldn't be jumping in blindly, building something from scratch. There's actually working systems (working well according to him) already out there on these, which is why I'm even considering it. Motec, umm... I'm pretty sure that will cost about the same as I paid for this car, so no. It's not some ballin car, it's an 18 year old lexus with 150k on it haha. I'm still a DSMer at heart, so $750 MS vs. $2000 AEM v2 is enough of a difference to make me take a step back and think. Send a private message to Super Bleeder!! Find More Posts by Super Bleeder!! Did some basic maintenance crap to it. Replaced burnt out bulbs, check oil and coolant and they both look brand new. Replaced the cracked LCD screen, and the back lighting light bulbs (I'll put up some random pics of that repair later). I have a little to-do list yet at home, but basic maintenance crap will continue over the rest of the fall, so it's ready for some "fun" work this winter.